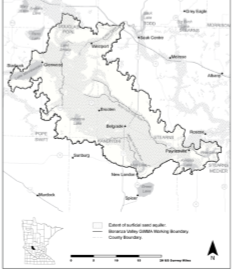 Pope County and the Pope SWCD participated in the Bonanza Valley Ground Water Management Area as part of the Minnesota Department of Natural Resources current project to analyze 3 pilot areas in the state that have sensitive groundwater features. The initiative began in 2014 and the final plan was adopted in 2016. The purpose of this initiative was to analyze water appropriation impacts and the Department of Natural Resources permitting process. The Pope SWCD role was as an advisory member to the process and staff has been providing feedback on any sort of impacts this may create for water appropriation permit holders in Pope County. Several local landowners who are water appropriation users were also a part of these important discussions to ensure water sustainability in our groundwater aquifers. The Pope SWCD monitors 23 observation wells annually for the Department of Natural Resources. This historic groundwater level information was used by the Department of Natural Resources as they analyzed the area and the ground water aquifers. For more information visit this website at: http://www.dnr.state.mn.us/gwmp/area-bv.html.